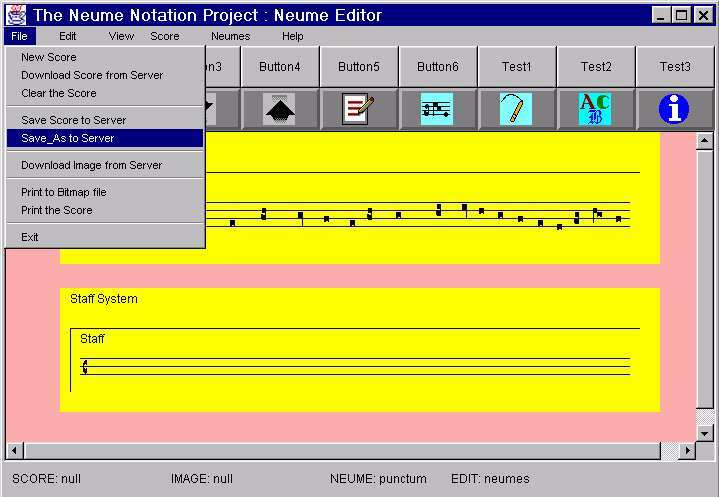 The Neume Notation Editor is written in the Java programming language as a Java applet. Applets can ordinarily be run in any Web browser that is enabled for Java. Security restrictions imposed by Web browsers prohibit Java applets from accessing resources on the user's computer, such as the printer and the local file system. Progress is being made for Java applets that are "trusted" by the user to have access to these resources. For now, however, such functionality is not available with the Neume Notation Editor. To use the Neume Notation Editor on your computer, your Web browser must include support for Java version 1.1, or higher. This typically comes with Internet Explorer version 4 (or higher), Netscape Navigator version 4 (or higher), etc. It might be of some interest to know something about how the Neume Notation Editor program has evolved. The first prototype used a specially-designed, TrueType font of square-neume symbols (see General Discussion about Fonts, and Samples of the Author's Neume Fonts). This font had to be installed on the user's computer in conjunction with the Java engine. It was later decided that the installation process was too much of a burden for users. Furthermore, different fonts had to be developed for display under Windows, Macintosh, UNIX, etc. The current Neume Notation Editor is platform-independent and requires no special installation since it no longer uses fonts. Click here to view screen shots from the first prototype. Below are two screen snapshots of the Neume Notation Editor and a link for running the applet. 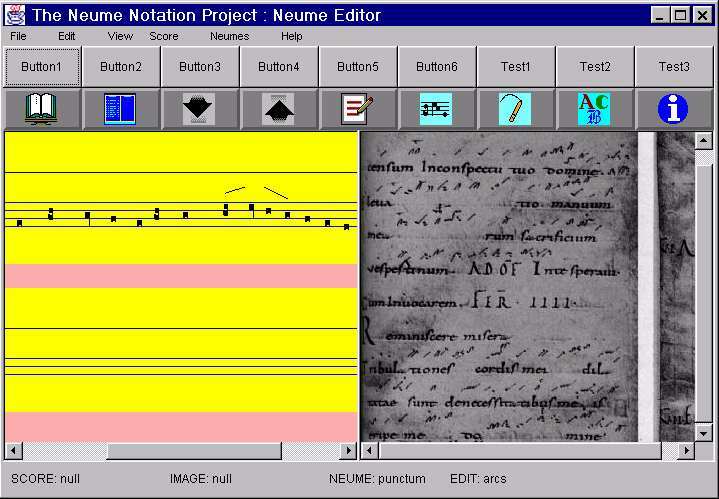 The screen snapshot above shows the Neume Notation Editor in normal edit mode. The user selects from a variety of staff styles and clefs. Neumes can be placed and moved within the staff. Currently, only square neumes are available. In this snapshot the File menu has been opened, and the Save_As to Server option has been selected for saving the score to the server. The screen snapshot above shows the Neume Notation Editor in split-panel mode. There are two panes: the left pane is for entering neume data; the right pane is for displaying an image of the neumed document that the user is transcribing. (A manuscript image is typically acquired by optically scanning a printed copy of the manuscript, or by downloading a pre-scanned image over the Web.) Both panes can be resized, and their contents can be scrolled in two dimensions. Click on this link to run the Java applet. 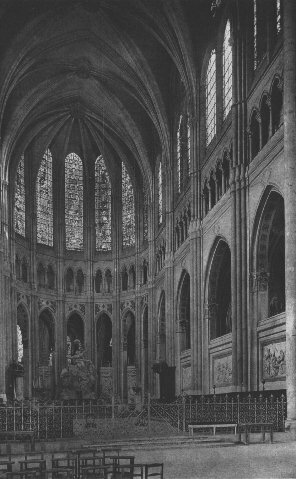 Credit: Photo of the choir of Chartres Cathedral reproduced from Robert Branner, ed., Chartres Cathedral, (New York: Norton, 1969), pl. 11.